race two class yachts, the IOM and the R6M. Although we hold organised racing for only the IOM and R6M classes we will welcome anyone with any RC sailing yacht. However we do suggest you contact us first, as occasionally sailing is changed or cancelled. Details of how to make a last minute check that sailing has not been cancelled can be found on the Sailing Programme. The sixes are basically semi-scale versions of their full size cousins. The six metre radio controlled yachts are usually around 1500 mm in length, are yacht-like in appearance and displace around 12 Kg. The class is very active in the UK but seems temporarily dormant in other countries. Six Metre yachts were raced in the Olympic Games from 1908 until 1936. The rule used today dates from the last rule simplification in 1933. NOTE: This is a much simplified version of the rating calculations. Please refer to the class rules on the Six Metre Owners' Association web site for more precise information. 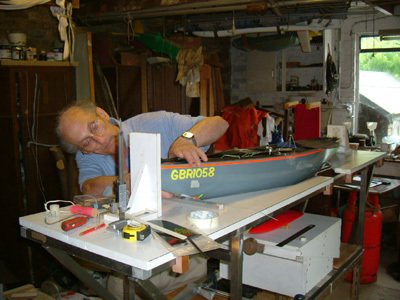 Measuring a Six Metre yacht is a complex procedure requiring specialist equipment including a measuring tank and measuring rig (see picture right). In the picture above the measurer is setting the water line gauge prior to moving the hull up to it's measuring position. This picture shows a typical 'dry' measuring rig in which measurements including draft, girth, water line length etc are taken. The whole measuring process may take up to 4 or even 5 or more hours before the boat's certificate can be 'signed-off'. In both photographs a District Senior Measurer poses for the photographer during the measure by a local measurer of Boat No GBR1058. The International One Metre (IOM) class yacht is, as the name implies, one metre in overall length. The design was created around 1988/89 with the aim of creating a class of model yacht that controlled costs while at the same time allowing the home builder some latitude in hull design and construction, within certain limits. There is now a wide range of designs and kits available from specialist suppliers. Contact the club or speak to a club member (pop down and meet us - you'll be made very welcome) if you wish to get started by either buying new, building or buying second hand. Both Sixes and One Metre yachts are featured on the SAILSetc web site. Watch Out! - There's a rule about. 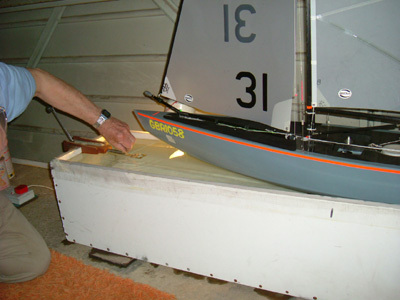 We are happy to teach beginners the yacht racing rules.